Country style has proved itself to be an enduring theme in the way we have decorated our homes over the years. It is easy to understand why - country decorating is comfortable and accessible; it is forgiving of wear and tear, of less than perfect combinations, and provides an oasis of warmth in a high-pressure world. The House and Garden Book of Country Chic has all the appeal of country decor but develops it into a more sophisticated look for the modern home, showing how to combine simplicity and warmth with style and elegance. The stunning illustrations have all been selected from the very best photographs published in House and Garden magazine and show how other people have set about surrounding themselves with visual pleasure. 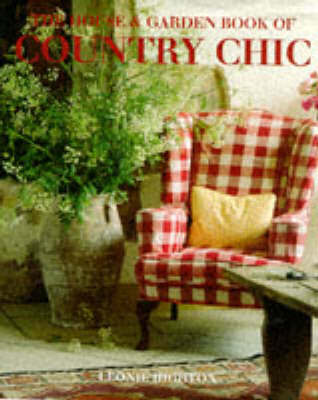 Room by room the chapters in the book consider the essence of chic country style and informative captions pinpoint the key elements. Reflecting the variety and flexibility of the style, the homes featured encompass everything from a classic English look to the warm hues of the Mediterranean or the wonderful natural textures of a retreat in the Far East. Whatever the location, and whether your taste is for cosy chintz, Scandinavian simplicity or Mediterranean earthiness, you will find in this book a wealth of ideas.